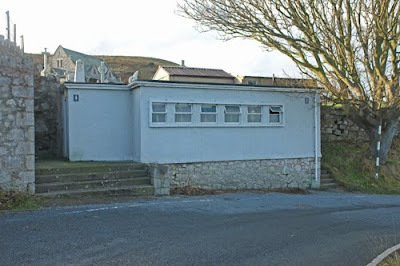 It may not be the prettiest building in the world, but if you're out walking on the Great Orme headland in Llandudno and have been 'caught short', then the public toilet block by St. Tudno's Church (just out of sight to the left in the above photo) has always been a welcome sight. Similarly, worshippers at St. Tudnos and visitors to the graveyards have also made regular use of the facility. Anyway, Conwy Council recently published their Appraisal of Public Toilets here and I was interested to see that, true to form, they have made an error in the Methodology that has resulted in the St Tudnos Toilets being given a low ranking in importance for being kept open. "0 assumed in absence of recorded data; however anecdotal evidence suggests that very little footfall traffic exists at public conveniences within a cemetery." So, not only did they not bother to actually record how many people used it, they also assumed no-one used it because it was 'within a cemetery'. As we all know, this is incorrect, its actually on a public road near to a small car park outside the Church/cemetery and is well used by both worshippers at St Tudnos and ramblers/visitors to the Great Orme. I understand that, following representations from the Parish of Llandudno, a Working Party has been set up by Llandudno Town Council to look at the problem. Let's hope that the Town Council overcome their usual timidity and seize this opportunity to maintain a very valuable public service. While they're about it, how about reopening the Public Toilets on Happy Valley Road (opposite the Grand Hotel) that have been closed for a couple of years? if, according to the council, no-one uses these toilets, then I presume the council aren't spending a penny (pun intended) on clealers, cleaning materials, toilet rolls etc. at these toilets and therefore it follows these toilets are not actually costing anything to run, therefore they can be left open?? If the council are spending money on toilet rolls, cleaning materials and cleaners then clearly they ARE being used! Total Annual Cost= £7347 - a figure which doesnt include an improvements/refurbishments to the Toilets. If the council workers who park at the toilets, in the cemetery, and by the toll gate got on with it, and stopped sitting in their vans for ages at a time more work would get done. Philip Evans and Mike Priestley have come up with a plan to save these facilities and four others in cemetries.They just need the support of their collegues on the county. I got 'caught short' when visiting Great Orme a while back, and the toilets in question were definately a welcome sight!